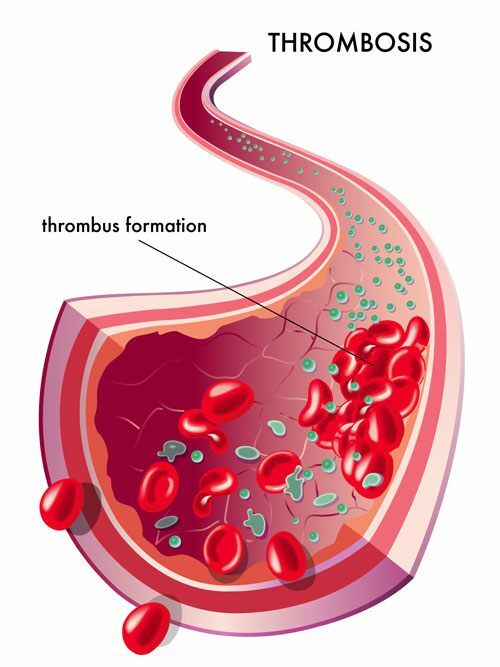 Blood clot is a mass of blood that changes from liquid to semi-solid state. Clotting is your body’s normal response to external injuries, to prevent you from losing excess blood. A blood clot usually forms when your blood doesn’t circulate or clot properly. When a blood clot forms in the deep veins of your body, in medical terms it is called Deep Vein Thrombosis (DVT). These blood clots typically occur in your thigh or lower leg, but can also occur in other areas like abdomen, pelvis and arms. DVT affects 9, 00,000 Americans every year, killing up to 1, 00,000, says The American Society of Hematology. DVT usually affects one leg. Anyone can develop DVT, but it is more common in people above 60. Also, factors like smoking, dehydration, taking birth control pills, genetics, being on long-term bed rest post surgery, recent pregnancy, sitting for long periods, cancer, obesity, liver and kidney diseases can raise your risk of developing DVT. People with heart failure also have a greater risk of DVT. 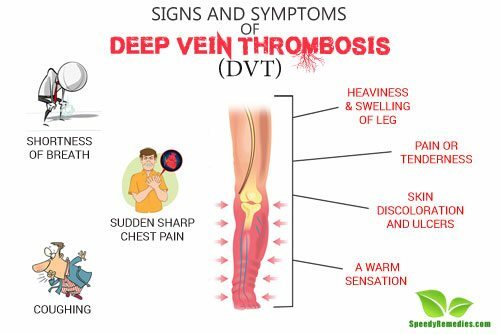 DVT is a potentially life-threatening condition and if left untreated, the blood clots can break away and travel to lungs and block the blood flow. A blood clot in the lungs is called Pulmonary Embolism (PE). PE is a serious medical emergency as it can sometimes lead to serious illness and even death. About 1 in 10 people with DVT develop PE and 1, 00,000 to 1, 80,000 Americans die every year as a result of PE, states Vascular Disease Foundation. It is very difficult to detect this condition as the symptoms may be hardly noticeable and even if they are they can be easily confused with other disorders. However, if in case you notice any of the following symptoms, it is advisable to seek medical attention. One of the primary symptoms of DVT is chronic leg swelling. This swelling of leg is called leg edema. A sensation of fullness/pressure/swelling/tightness occurs, especially while standing up. Patients often describe it as an odd pulling sensation or tingling that doesn’t go away. According to a 2000 study published in the Journal of General Internal Medicine, postphlebitic syndrome, a condition characterized by leg swelling, pain, venous ectasia, and skin induration, is established by 1 year after DVT in 17% to 50% of patients. The swelling usually happens on one side of the leg starting from the foot rising up to the ankle. This swelling is worse after sitting or standing for long periods, but it reduces when you walk. However, at times exercise can worsen the symptom if the obstruction of the blood flow is severe. In some patients, swelling may never disappear, whereas in others swelling subsides initially but may return in the next few years. Leg swelling doesn’t necessarily indicate DVT, but if you have a sudden onset of increased leg swelling or you notice a difference in the appearance and feel of the affected leg compared to the other, seek medical attention. Leg pain and tenderness is one of the prominent symptoms of DVT. Leg pain can have many reasons but DVT associated leg pain develops usually in the calf region and in the mid region of the thigh. Untreated venous thrombosis may result in more pain, destruction of valves in the veins, clot that migrates to the lungs. The pain usually tends to subside as you take rest for some time or when you elevate your leg, but soon comes back as walking resumes. This happens because of the pressure exerted on the blood clots. In case of such a pain, you should immediately consult your doctor. You can also try the Homan’s test for DVT. If you feel pain in the upper part of your calf when your legs are straight and up and when the toes are pulled with the hands, there may be chances that you might have DVT. This is one of the most common clinical tests for identifying patients with DVT. But Homan’s test is non-specific as Homan’s sign is found in more than 50% of the patients without DVT. Certain parts of your leg may turn blue or red in color. This is called hyper-pigmentation or skin discoloration. This happens due to the blood clot developing under the skin of that part of your leg. The area where the blood clot develops is generally a high pressure area and as red blood cells pass through this area, they breakdown and this causes skin discoloration. Although skin discoloration doesn’t necessarily indicate DVT, but the discoloration can be a strong indicator. The discolored area may be swollen, painful, warm and tender. Most of the times, the discoloration will be accompanied by others symptoms of DVT. The skin in this area then becomes dry and flaky, causing itching. Continued inflammation and irritation can cause skin breakdown, eczema and skin ulcers. The ulceration occurs more often in the inside part of the ankle. Scratching of this area can further aggravate the skin. Those who have developed DVT may feel a warm sensation in the affected area. The affected area may be warmer than the other areas surrounding it. This is usually accompanied by swelling and pain, but can also be devoid of any symptoms. You can feel the rise in temperature by touching it with the palm of your hand as hands usually have lower temperature. Whenever you experience pain after walking, sit down and rub your hand over the affected area whenever you are feeling the pain. If it is warm, consider seeking medical help. DVT can become fatal when it leads to Pulmonary Embolism (PE). As PE is potentially fatal, it is advisable to take a note of the following symptoms. Shortness of breath or dyspnoea is one of the most frequent symptoms of PE, according to a 2007 study published in the American Journal of Medicine. Dyspnoea can develop rapidly within seconds or can happen gradually over few days. It can vary from very mild to obvious shortness of breath. Having short, irregular breath is an indication that the blood flow in the lungs has been blocked due to a blood clot. You may have difficulty catching your breath at rest and the shortness of breath becomes worse with activity. The chest pain is more like a sharp or stabbing pain; it may also be aching or dull, burning, heavy sensation. You may likely experience the pain under the breastbone or on one of the chest. The chest pain may spread out towards your arm, shoulder, jaw or neck. It gets worse when you breathe, cough, eat, bend or stoop. With activity, the chest pain gets worse and does not reside when you take rest. Coughing in pulmonary embolism can begin suddenly. It may or may not produce significant amounts of blood or mucus that contains blood. Usually shortness of breath is accompanied by coughing. When the blood clot travels to lungs and obstructs the blood flow there, it makes breathing difficult, thereby causing coughing. A heart rate that is greater than 100 beat/minute while you are at rest indicates a blood clot. The heart is responsible for pumping blood that transports oxygen to all parts of the body. When your lungs have insufficient amount of oxygen due to blood clot, it sends signal to your heart demanding to increase the heart rate so as to make up for the lack of oxygen. Usually a rapid heart rate is accompanied by dizziness, shortness of breath or light-headedness. Drenching night sweats is one of the presenting symptoms of submassive pulmonary embolism, states a 2015 study published in Case Reports in Pulmonology. They can help in early diagnosis of PE. Night sweats may also be accompanied by pleuritic back pain. Fever has long been recognized as commonly accompanying PE. Although a low-grade fever is not uncommon in PE, a high fever is very rare in PE, according to a 2000 study published in Chest. PE-related fever is usually low-grade, rarely exceeding 38.3°C, and short-lived, reaching its peak the same day on which the PE occurs and gradually disappearing within 1 week, according to a 2007 study published in Circulation. Move around as much as possible. Raise and lower your heels while you keep your toes on the floor and raise and lower your toes while you keep your heels on the floor. Do these 10 times or at least every half an hour. Raise your left leg off the floor. Straighten the leg slowly. Return back to the floor and repeat the same with your right leg. Alternatively, lift up your knee to your chest, and then bring it back to the floor. Repeat with your left leg. Drink plenty of water or fresh juices. Fluid will help to thin your blood and decrease the chances of blood clotting. Avoid coffee, black tea and energy drinks as caffeine is diuretic and can stimulate urination. Hence, it can dehydrate your body. Avoid smoking as smoking can make your blood thicker and hyper-coagulate thereby increasing the chances of blood clotting.